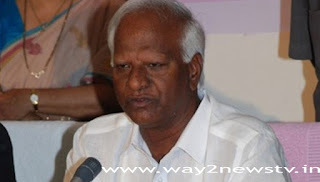 Nagar Kurnool, January 8 (way2newstv.in):Deputy Chief Minister and Education Minister Kadiyam Srihari said that Telangana education is not in the country. Chief Minister KCR is spending more funds for education. Kodiyam Srihari, Deputy Chief Minister and Education Minister, participated in various development and welfare programs in Nagar Kurnool district. Laying the foundation stone for an estimated 50 lakh rupees in the village of Kayamkulam, Later, the Kasturbhah Gandhi Girls 'School was distributed to the students' health kits. She was also the chief guest of the alumni meeting held at the Amarabad Judge School. The tragedy has been laid on the mission of the Mission Bhagirath program in the city Panchayat. Speaking on the occasion, he said, "The Telangana government has come to the extent that it has never been in the country ever since. Before the formation of Telangana state, 316 Gurukuls ... After the formation of Telangana state, Chief Minister KCR has created 544 Gurukulas. Similarly, for the establishment of new zones and districts for administrative convenience, 84 Kasturba Gandhi Girls' Colleges have been brought to Telangana for new mandals. Telangana state is the state with the largest Kasturba Gandhi Girls' education in the country. In addition, KGB has spent Rs 370 crores for infrastructure. Providing good quality education and providing good nutrition. Mutton twice a week, four times a chicken, egg every day and ghee. Heat water plants are being set up for bathing in winter. Besides, drinking water supply is provided by Arrow Plant, CeC cameras, Bio-Matrix machines, Computers, Practical Labs and Sports Material. Deputy Chief Minister and Education Minister Kadiyam Srihari said the massive program 'Mission Bhagirath' is already appreciated in the country by everybody in the state. Today, it is happy to lay the foundation stone for Mission Bhagirath program, which will be followed by 38.50 crore rupees. Presently, Telangana is leading in the country with the highest welfare programs in the country. Former Minister of State for Rural Development, Nilgiris Balaraju, local leaders and officials participated in the development programs in Nagar Kurnool.